They are any new colourful, fun pair of socks (you maybe wearing some right now). How do you get your socks? Organizations either collect new socks or people donate money and we buy wholesale socks for less than $2 a pair. Being Grounded – When we live in the past or surf the future, we can be consumed with ‘why’ and ‘what if’ the greatest joy is found in being where our feet are and being present and grounded in the moment. Being Genuine – We experience the most joy when are true to ourselves, are accepting of who we are and what lights us up. Socks are a fun way to let our own ‘freak flags’ fly! Being Grateful – Joy is very vulnerable, we feel happy when things are going well, however sometimes instead of enjoying the moment we think of what could go wrong. Joy is so worth feeling and colours our lives with all sorts of deliciousness. Joy Socks always bring a smile, if nothing else one can look at their socks and feel gratitude. Being Generous – The entire Joy Socks Movement is based on a simple act of kindness. 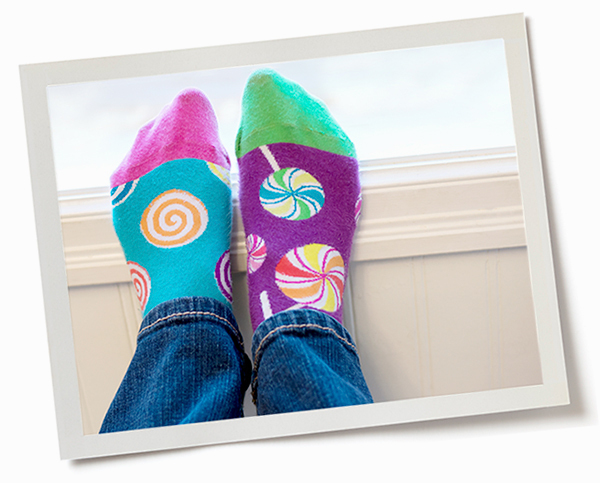 People who collect, give out the socks, or are recipients of Joy Socks are all part of a yummy web of generosity. Generosity is the birth place of joy. Who do you give your socks to? We give Joy Socks to non for Profit organizations – hospitals, shelters, Boys and Girls Clubs, Ronald McDonald Houses (to name a few). Do you donate them to individuals? Not at this time. We would need a volunteer to pick and pack the socks and ship them for a donation. If you’d like to be this volunteer, contact us! Is it possible to host a Joy Sock Collection Drive if I don’t live in Calgary and donate the Joy Socks to an organization in my area? We would sure love to consider it. Please contact us and we will do what we can to make it happen. I am going overseas to work with under privileged people. Could I bring some along to hand out? We love that idea! Please contact us to see what we can do. Join the Joy Sock movement! Post a pic of your Joy Socked feet with the #joysocks. Sparking Joy one pair at a time. © 2016 Joy Socks | Website by Fetching Finn Inc.